A Lieutenant Colonel and three militants were killed in an encounter between militants and security forces at Bandipore in Baramulla district today. Elsewhere, three persons, including two militants, one of them a top militant of Lashkar-e-Toiba outfit, were killed in separate incidents in Kashmir valley while four civilians were injured in a grenade explosion at Kulgam in south Kashmir. The US Congress is likely to pass the Bill regarding civilian nuclear cooperation by next month end after which the stage will be set for India passing the muster at such world fora as International Atomic Energy Agency (IAEA) and the Nuclear Suppliers Group (NSG), US Ambassador David C Mulford said today. Pakistan President Pervez Musharraf has stepped up rhetoric on Kashmir after a long gap by telling India that he might revert to the demand of third party intervention if his proposals of demilitarisation and self-governance in the region were not considered “positively” to resolve the issue. Do you think that the government is serious about combating rising prices? A day before a Senate panel approved a Bill on India-US nuclear deal, the Bush administration asked Congress to approve the sale of 18 new F-16 jets to Pakistan. Goalkeeper Jens Lehmann was the toast of Germany as the hosts progressed into the semifinals of the World Cup with a sensational 4-2 penalty shootout win over Argentina here today. 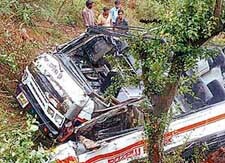 As many 19 persons were killed and 15 injured, four of them seriously, when a private bus rolled down about 250 ft down the hill slope near Ghanhatti , 13 km from here, today. The sweeping powers enjoyed by the Punjab Vigilance Bureau have been done away with. The Punjab Government has issued instructions to ‘‘redefine’’ the role of the bureau and has reduced it to a ‘‘toothless tiger’’.